The Samokhodnaya Ustanovka 122 (SU-122) which means self-propelled platform with 122mm gun, in this case the 122mm D-30S howitzer. The Russians employed artillery pieces as direct-fire weapons to counter German armor as well as hardened emplacements. The D-30S was mounted to the front of a T-34 chassis and had a relatively low profile on the battlefield. When a crew could put a D-30S round on a Tiger tank, the combination of kinetic energy and blast would blow the turret off. While over 1,100 SU-122s were produced, the D-30S was found to be less accurate and difficult to operate within the confined space of the vehicle. 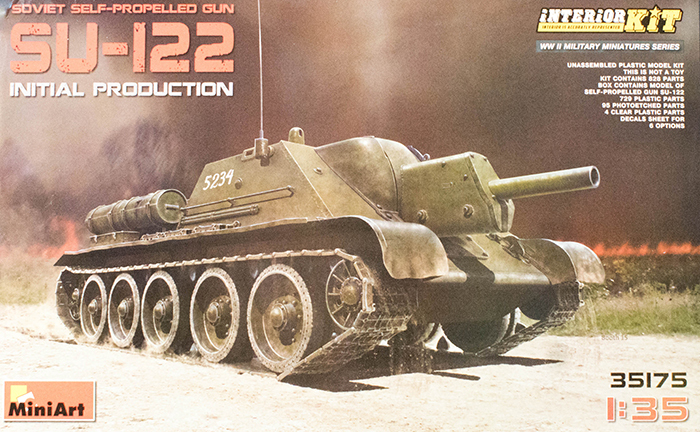 For many years, Tamiya provided the best kit of the SU-122 in 1/35 scale, but that has changed. 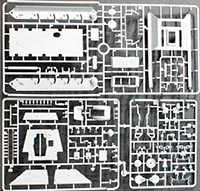 MiniArt has released the first of several kits of the SU-122, this representing the initial production version of the vehicle. What's more, unlike the Tamiya kit, this kit has a full interior - fighting compartment and engine compartment! You're going to find yourself conflicted as you'll want to build up this kit to show off a war-weary vehicle, but you'll want to figure out a way to leave the upper hull removable to show off all of that detail inside. 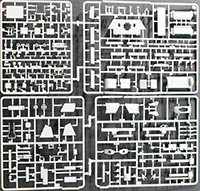 The kit is molded in gray styrene and presented on 68 parts trees plus two trees of clear parts (duplicate trees not shown) and one fret of photo-etched parts. According to the manufacturer, there are 733 plastic parts and 95 photo-etched parts in this box. I believe it as there is some serious mass to the box when you pick it up. If this seems a little intimidating to you, not to worry as MiniArt is releasing a version without an interior which will significantly cut down on parts count and complexity. When I saw the note in the instructions that "Each track link contains 36 parts..." I about fainted. The current project I'm working on has four parts per track link and it is already a pain, but this turned out to a translation error as it says in Russian that each track run consists of 36 links with guide teeth and 36 without - one-piece track links. Whew! There is a lot of kit here for the money and lots of detail to keep you busy. What is especially promising is the T-34 chassis which I hope will result in a T-34 with full interior as well (I know it has been done before elsewhere, but wait until you see this kit. Given the number of small parts and intricate painting required to get this all together, I recommend this kit for experienced modelers with good tools. The one down side to this kit is MiniArt is still providing color profiles and paint instructions using Mig paints and only Mig paints. Since Mig paints are not widely available and many modelers have other preferences, it would be nice to see MiniArt provide paint charts with other brands' colors listed as well. One note on pricing. The MSRP listed above is published by the two importers of MiniArt into the US market. As with many brands produced overseas, there is a bit of markup happening when these products are shipped into the country. If you're uncomfortable shopping with overseas hobby stores, by all means grab one of these kits. However, if you are willing to shop around, you'll find that the retail price of this kit, for example, is around $45 USD in several overseas shops. Some of these shops will even provide free shipping if you place a minimum order. If you want a nice kit of a Soviet Army mobile assault gun, this SU-122 is their nicest kit produced to date and they offer another version without the interior for those that prefer a faster and easier build.